While importing surface data from Google Earth is probably the easiest way to get some conceptual topographical data into your drawings, DEM’s have to be a close second. For the uninitiated, DEM’s or Digital Elevation Models could be described as a surface whose data is organized in a grid. This is fundamentally different than DTM’s (standard Civil 3D surface) which still stores a collection of points, but in the form of triangles not a structured grid. 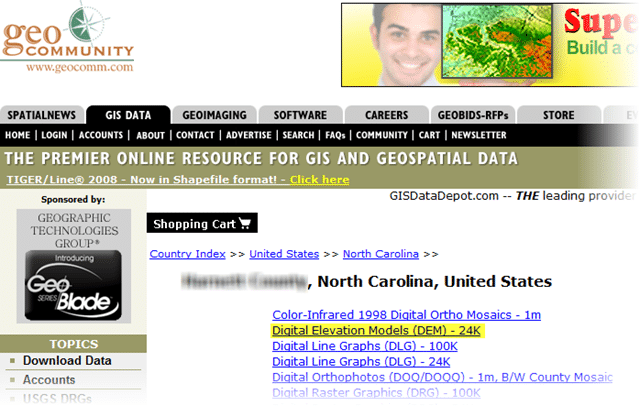 The great thing about DEM’s is they’re readily available for FREE from a wonderful website named the Geo Community. Now don’t be fooled when you visit the site as you will see all sorts of premium content; never fear as there’s ample data that can be had for free! 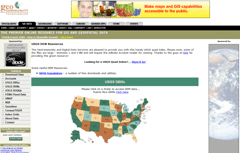 Using the map, click on the state your site is located in. Find the county from within the state you selected. Click the green download button for the necessary Quad. Downloads from the Geo Community website are provided as a TAR.GZ file. This is a compressed file format similar to a ZIP file. To get the DEM we must first unpack the file. While there’s an endless list of programs that can do this, I prefer 7-Zip (Free Download). Note: I placed the file in an empty directory. Depending on your files location you may choose to use one of the other extraction options. You will now have a series of DDF files. 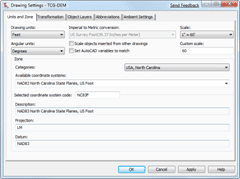 Civil 3D cannot read a DDF file, and therefore must be compiled into a DEM file. 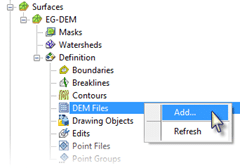 Before we can use the surface in Civil 3D we must first compile it into a single DEM file. This is done using yet another free download named sdts2dem.exe. It’s just a small console application that will produce the DEM file necessary for Civil 3D. 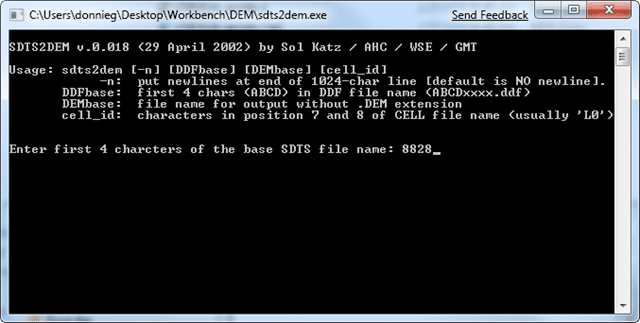 Double-click the sdts2dem.exe file to run the executable. Accept any security prompts that may appear upon running the program. Upon running the program you will be prompted to enter the first 4 characters of the SDTS file name. This is the first 4 characters of the DDF files, not the initial TAR.GZ file. Next you’ll be prompted to enter the output file name. While you can name this anything you want, it’s recommended you name it after the Quad name. 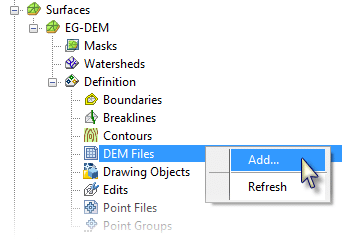 After completing step 5, you will now have a .DEM file that can be used to build a surface in Civil 3D. Make sure the correct coordinate system is assigned to your drawing. Settings tab, right-click / Edit Drawing Settings, Units and Zone tab. Define your surface by giving it a name, assigning it’s style, etc. Note: I prefer naming my surface something like EG-DEM to make it’s origin very obvious to other team members. 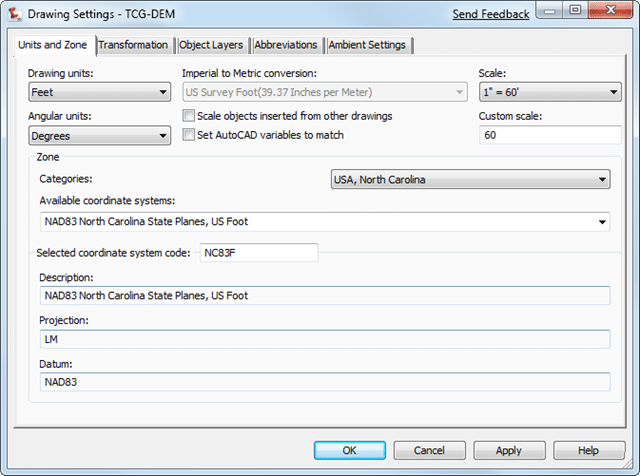 With our DEM file teed up, we now need to tell Civil 3D how to project the DEM surface to my current coordinate system. Look at the information listed under DEM file information to discern your source coordinate system. 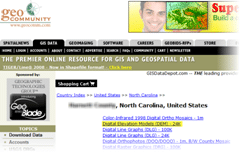 Most DEM’s you download from the Geo Community will use a UTM with NAD27 datum. Likewise the units for most DEM’s will be meters. You can use this information to select the appropriate coordinate zone. The illustration has been color coded to show how to match up the information inside the “DEM file information” with the information needed inside the “Select Coordinate Zone” dialog. 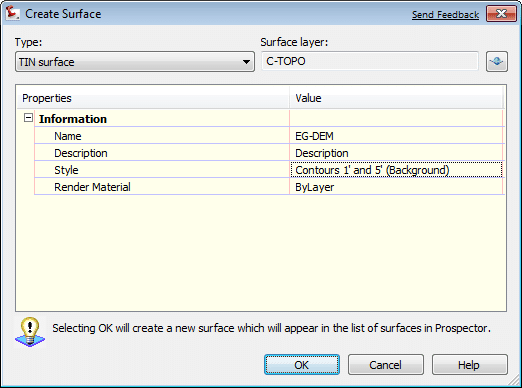 [Ok] out of the dialogs, and Civil 3D will build & display your DEM surface. I have a set of 4 DEM grids. In order for me to create cross sections to get the quantities, I need to have a single survey surface on to which I can target the assembly. I prepared data shortcuts of these 4 grids. How do I combine these into a single surface? I found the DEM files to be way to large to use as is. DWG file size gets huge (40+) mb, crashes a lot, won’t export to AutoCAD etc. To get a reasonable surface size after importing the DEM I had to draw a reasonable boundary, extract that smaller surface area, then create a new surface with the extracted surface in a new file. @re-surfacing There are a number of variables that can play into the size of an imported DEM surface. As you note, generally your downloaded area is much larger than you truly need for a given project. Assuming you’re using Civil 3D 2009 I’d recommend 2 things. First, use the simplify surface command in C3D. This will remove unneeded points, thus reducing it’s overall file size. The second thing, 2009 introduces a new boundary type; data clip boundary. 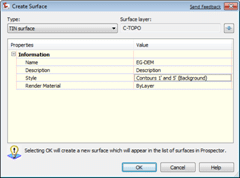 Something to keep in mind with data clip boundaries is it must be the first item in the surfaces definition (eg. before the DEM file itself). If you forget to apply the boundary before importing the DEM, no worries. Just go to the surfaces properties, and move the data clip boundary to the top of the definition list (also something new to 2009). 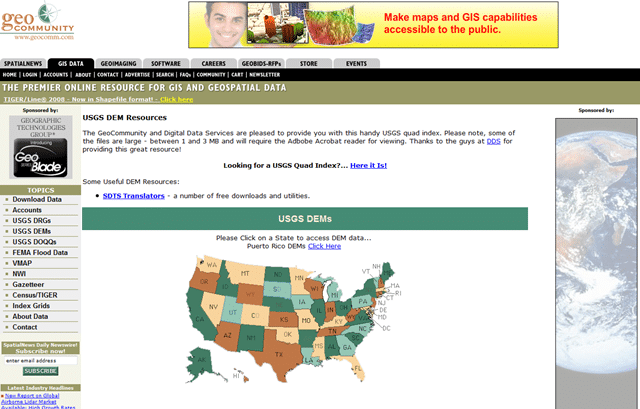 Much of the USGS DEM data is also available in ESRI’s grid format, which C3D 2009-up can read directly. I have also worked with a number of Canadian DEMs that are published in the original USGS format, requiring no conversion from SDTS. I’m not sure why the Desk doesn’t read SDTS directly, but much of the community hates SDTS anyway. One thing you have to watch out for in any case (Canadians DEMs especially) is that the elevation values may be integers. C3D’s contouring and smoothing algorithms don’t really handle that situation well, resulting in a stairstep contour and a similar profile. @Earl – Thanks for the extra info! Being in Richmond, VA, Canadian DEM’s are especially something I’ve never encountered.